Two ITVS projects have been recognized by the Webby Awards, the leading international awards for excellence on the Internet, which were called “the Internet’s highest honor” by The New York Times. 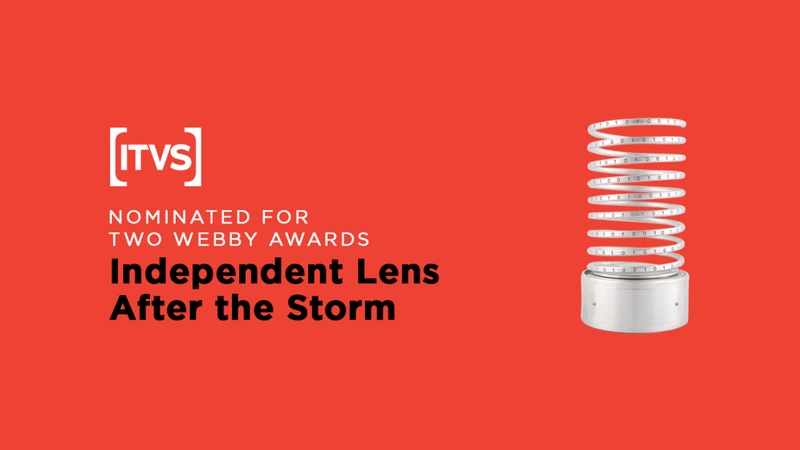 The nominees, selected by members of the International Academy of Digital Arts & Sciences, include the newly relaunched website for Independent Lens, the Emmy Award-winning weekly television series on PBS, and After the Storm, an innovative interactive web project. The public may vote for the People’s Voice Award on the Webby site from now until April 21st. (So, needless to say, we encourage every one of our viewers and readers to vote for us as soon as you can!) The Webby Awards recognize excellence in websites, online film and video, advertising and media, mobile sites and apps, and social. This year’s competition received nearly 13,000 entries from nearly all 50 states and 65 countries worldwide. Winners will be announced April 26 and honored at the 20th annual Webby Awards ceremony on May 16 in New York. Nominated in the “Movie & Film” Websites category is the newly relaunched site for Independent Lens. Commissioned by ITVS and designed and developed by WNET&apos;s Interactive Engagement Group, key updates to the website include full mobile compatibility to ensure a consistent user experience across devices, a rebuilt Watch Video section to consolidate all of the compelling video from the series in one easily searchable and browsable library, and an immersive, character-driven design that reflects the unparalleled eye for detail that Independent Lens filmmakers knit into their stories. Through backend wizardry, the WNET Interactive Engagement Group also built in lightning speed without sacrificing high-resolution beauty. After the Storm, a nominee in the Online Film & Video “Art & Experimental” category, is an interactive web project jointly distributed by Independent Lens and The Washington Post. A full-screen narrative project that provides a personal and poignant reflection on the deadly 2011 tornado that ripped through Alabama, the project is co-created by Andrew Beck Grace, a Tuscaloosa-based filmmaker who lived through the event, and the Helios Design Labs of Toronto. Developed over the course of a year through a unique collaboration between filmmaker and designers, the goal of the piece was to communicate an intimate and personal experience for the viewer by giving them an immersive and tactile landscape to explore. After the Storm is also recognized by the Webby Awards as an Honoree in the Online Film & Video “Best Use of Interactive Video” category.